This is my new BeagleBone Black (BBB). 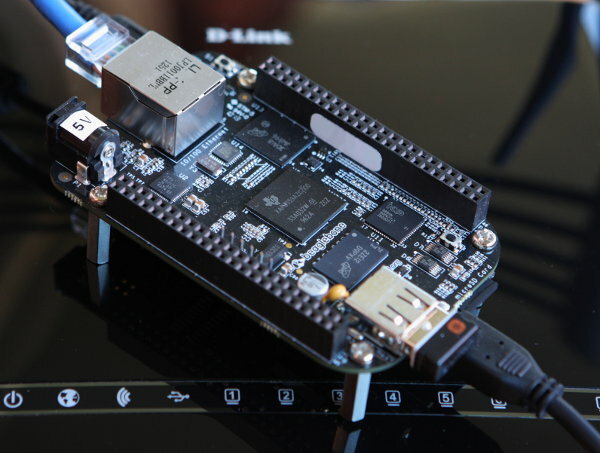 It is an ultra low cost ($45) ARM computer that readily runs Operating Systems such as Linux or Android. It is based on Texas Instrument Sitara Cortex A8 1 GHz System-on-Chip. I won’t attempt to describe the board in detail as there are already many good descriptions on the Internet. This board is often compared to the Raspberry PI (RPI). This site has good comparison: http://www.cnx-software.com/2013/04/25/beaglebone-black-vs-raspberry-pi-features-and-price-comparison/ . The two boards are similar in many way, but there are differences. The RPI is better suited for video playback, and the BBB is better suited for hardware development or hacking. This BBB has much potential. With a microcontroller (eg. PIC or AVR or Cortex Mx), it is a lot of work to implement high-level functions such as tcp/ip, graphics, file-systems, threading, webservers, etc. There are libraries available, but are usually costly and feature limited. High-level libraries are available for the BBB for free as part of the Linux operating system. With computers running desktop operating systems, interface to hardware peripheral is usually limited to USB or RS232. The latency of such interface is usually high and not guaranteed. I’m hopeful that the BBB can overcome this limitation. The Sitara System-on-Chip contains two Programmable Real-time Units (PRU). A PRU is a separate 200 MHz CPU core that is meant to implement “soft” peripherals, peripherals with tight real-time constraint. This entry was posted in Electronics on May 18, 2013 by stephen. Your RTL SDR demo was very impressive. I have an RTL SDR dongle lying around somewhere in a cupboard, I’ll have to dig it out and see if it has a suitable chipset. Thanks for making the source available. I was wondering if you had made any progress using the BBB PRU processors, and if so how you were finding them to use? I have not used the BBB PRU yet.